Please refer to our stock # 1999 when inquiring. 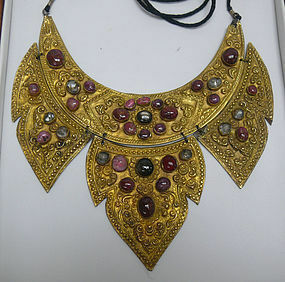 19th Century Balinese Composition Necklace, or collar (four sheet gold with copper backing,) Cabochon Rubies and other semi precious stones. In hardwood box and in excellent condition. Dimensions approximately 5" high x 5" wide. Ex: Jonathan Tucker and Antonia Tozer Asian Art, London England. Legong dancers are always girls who have not yet reached puberty. They begin rigorous training at about the age of five. These dancers are regarded highly in the society and usually become wives of royal personages or wealthy merchants.